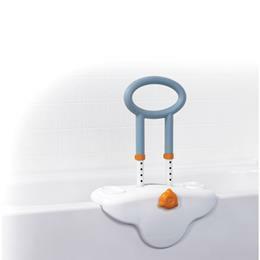 This clamp on tub rail designed by world renowned architect/designer Michael Graves features both beauty and functionality. The signature MG "Orange Activates" incorporated into Michael Graves designs allows for a visual pin point signifying easy operation. The orange turn knob is easy to adjust allowing for one step installation. 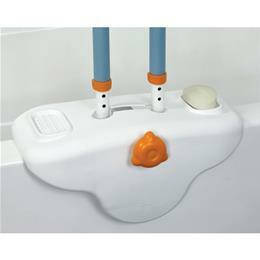 The base clamp is width adjustable from 3"-7", fitting most standard-sized tubs. 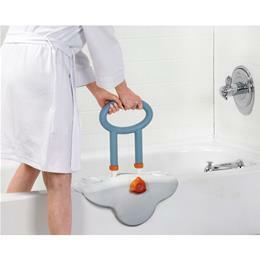 The greatest feature on the Michael Graves tub rail is the contoured soap and shampoo holder. Steel construction ensures durability while a clean white and blue/grey finish will complement any style bathroom. The oversized handle can be height adjusted from 14" - 17" for personal comfort ensuring optimum stability and security. 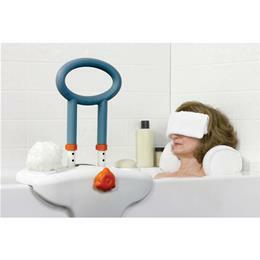 Not only is this tub rail guaranteed to make your bathing experience more enjoyable but it won't scratch your tub and will ensure a safer and more comfortable bathing experience. The product is protected with a U.S. Patent No. D566,250. height adjusts from 14" to 17"
Width adjusts from 3" to 7"